Here is a pretty little ring top from Wahl. The red/black woodgrain still looks quite vivid with just a tiny bit of fading. The gold filled trim also looks good with just a little bit of brassing on the crown of the lever. It’s a stunning little pen. The 14kt. 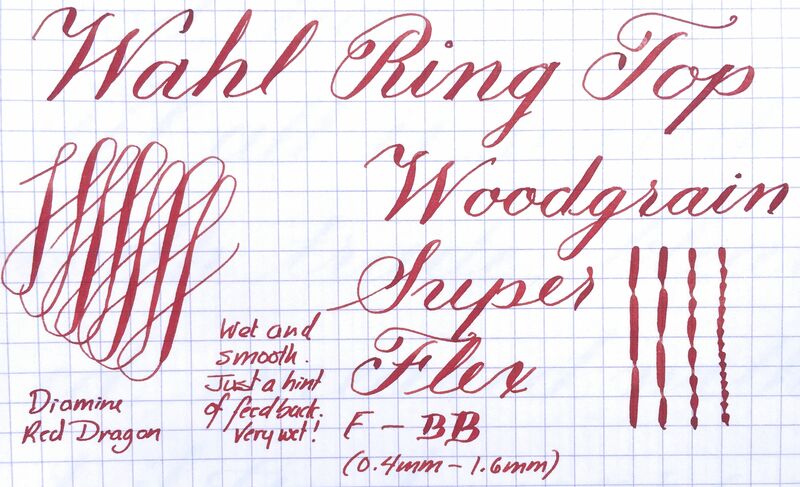 Wahl #2 nib is juicy writing F that is smooth with just a hint of feedback to it. The tip of this nib was bent. I straightened the nib out and realigned everything about as good as you can get it. The effect now is purely cosmetic and has no bearing on the performance of the nib. You can just tell the tip of the nib has been marked up a bit in the past. It still has some nice flex going from F to BB (0.4mm to 1.6mm) with plenty of flow to keep up without railroading. A stunning, portable pen with some nice flex ability.